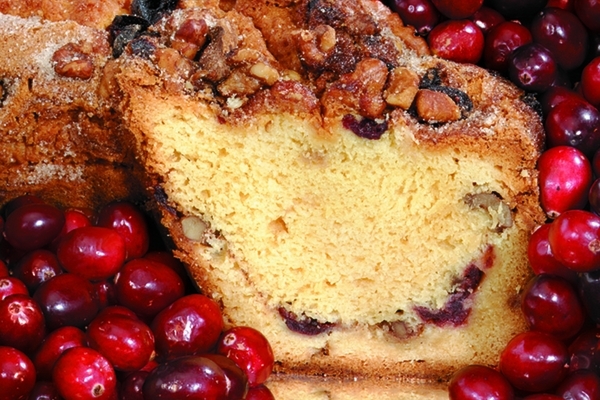 We start with large chunks of New England's most famous cranberries, farm fresh eggs, add pure New England maple sugar and bake it to perfection. If you love old fashioned, homemade coffee cake, you will love ours. 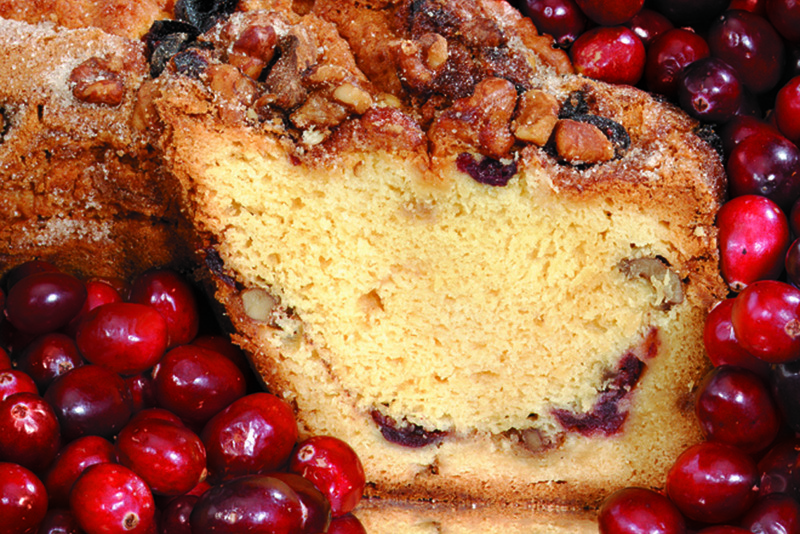 Cape Cod Cranberry Coffee Cake - Net WT 1.75 Lb. Sugar, Sour Cream( Cultured Pasteurized Milk, Cream, Nonfat Milk, Potassium Sorbate, and Rennet), Enriched Bleached Wheat Flour, Eggs, Soybean Oil, Cranberries, Maple Syrup, Walnuts, Palm Oil, Leavening (Monocalcium Phosphate, Sodium Bicarbonate, Sodium Acid Pyrophosphate, Cornstarch), Modified Food Starch, Propylene Glycol Mono and Diesters of Fats and Fatty Acids (Emulsifier), Vanilla Extract, Cinnamon, Dextrose, Egg Whites, Mono and Diglycerides (emulsifier), Salt, Natural Flavors, Sodium Stearoyl, Lactylate (emulsifier), Tetrasodium Pyrophosphate, Disodium Phosphate, Xanthan Gum, Calcium Sulphate, Gum Arabic, Soy Lecithin, Cellulose Gum, Extractives of Tumeric (for Color). Contains Eggs, Milk and Soy. This coffee cake was very moist and delicious. Pleasantly surprised as many coffee cakes can be quite dry. Took this to work and they all loved it. I've never got this quality of product from the store. Will order again. ProsFlavor was wonderful and moist. this was a gift.........2nd order this calendar year. I was told by recipient that products were enjoyed. they included cranberry and blueberry coffee cakes along with cashews. I will accept their comments and will probably visit your website again soon..........for another order. orders seem to arrive on time and in a desirable form. I ate it all myself, didn't share any of it. It's that good! I did not actually get a chance to sample this cake, but I sent it to my Mom for Mother's Day & that's what she said about it. Even the packaging was first class. The fruit throughout made it very moist, too. ProsFirst class item and packaging. ConsA bit pricey unless you can catch it on special. Tastes just like homemade. Very moist, and had the perfect ratio of cranberries and nuts. Worth the price. Mother always enjoys this coffee cake. At 97 there are very few things she really enjoys. We received this cake at our office today. It is absolutely one of the most delicious cakes Iâ€™ve ever eaten. Everyone loved it. I will definitely purchasing again in the future.